My interest in no-till farming really started about 5 years ago when I was managing a diverse 3-acre farm. For the first time ever, I used a walk behind roto-tiller to till the soil before planting. I will admit, there was a sense of power I felt but then quickly a feeling of dread accompanied that. Dread because I knew I just damaged a beautiful, perfect system and it felt wrong. There had to be a better way. I talked with my farm mentor at the time and he was skeptical to my desires. Could no-till really work? We couldn’t find any examples of successful no-till farming systems, but I knew in my heart it was possible. My mission to try no-till farming was stunted when I found out I was pregnant and suddenly needed to plan my life. Fast-forward to living in Davis and my son is 6 months old or so. I knew I needed to farm again and my mission to learn about no-till growing was re-sparked. I became aware of two farms pioneering this no-till farming movement. Singing Frogs Farm in Sebastopol is amazing as well as Bare Mtn Farm in Oregon. They both have been no-till farming for a number of years and have been sharing their methods through workshops, public speaking, YouTube videos, and blog posts. Thanks to their efforts and sharing their methods, I felt comfortable trying no-till farming on my own. This wasn’t easy and I’ve learned a lot. Heck, I’m still learning a lot! I’d love to share with you the bit that I do know to hopefully inspire you to start on a no-till growing journey. This post is meant to provide a general overview of No-till growing touching on the Why and provide detailed descriptions of just How to do it. Why? Why shouldn’t we till the soil? Imagine a natural disaster… Mud slides, hurricanes, tornados, earthquakes, wildfires, and tsunamis. Pick your favorite three and imagine all three happening simultaneously at the highest magnitude possible. Intense, right? Everything above ground would be obliterated. THAT is exactly what we are doing to the life under ground whenever we till the soil. I’m not kidding. Soil is full of life from fungal aggregates to bacterial colonies to macrobiotic life. There are communities and layers upon layers of life that have taken time to establish. When we till, we disrupt all of that. We kill all the life that was there. How ironic is it that we kill life in order to grow new life? This only scratches the surface, really. From carbon emissions and soil loss to creating hard pans and loss of organic matter, there are plenty of other reasons that should convince you not to till the soil. You can read about those more extensively in my other post, Why No-Till? Now that I hopefully have you convinced to not till the soil, the next question is, how do we do it? How can we farm quality produce without fluffing up the soil? What are the methods? There are several methods you can take and no, you do not have to till the soil first to get started on no-till growing. There is essentially one common factor between both methods that you have to keep in mind. The aim is to build up the soil! Know that this will happen over time, and little by little. If we want to regenerate the land, we have to start thinking 7 generations ahead. To get started on no-till growing, one method is to do sheet mulching. This would mean laying down cardboard over your growing area. If you have grasses or weeds growing, the first step would be to mow that down. Cover with cardboard and then cover with a couple inches of compost and any amendments you need to add. You can find out which amendments are best to add from having a soil analysis done. I personally have added some amendments without doing a soil test first, and later had one done. The amendments I add are azomite/ volcanic rock dust, feather meal, and oyster shell. More on these in a bit. After you covered with compost and amendments, you’ll want to cover with straw mulch. Rice or wheat straw is fine as well as alfalfa, but do not use Hay due to weed seeds. After all this layering, you’ll want to wet it all down. Set up a sprinkler or time this project right before the rain. The water brings the organisms to life. You should be able to plant within a week after watering. Don’t worry if you have to cut through a little cardboard to plant or if you see the layers and it doesn’t feel incorporated. Know that you will be planting into your native soil. I know that seems scary, but just trust. You are just starting the process and it’ll only get better from here. Azomite is key because it adds trace minerals. You only have to do one application every few years, apparently. Unlike the other amendments, which get added every time a new crop goes in. Oyster shell is used for calcium. Most soils are calcium deficient (The native clay soil I farm on was confirmed Ca and mineral deficient through a soil test). However, I recently learned that over time the oyster shell might lower the pH of your soil. A suggested alternative by several farmers was to try gypsum, which has naturally occurring sulfur in it that will not lower the pH of your soil. Again, a soil test is necessary to know whether you may want to lower your pH or not determining which amendment is best. Feather meal is great to add for nitrogen. Blood meal is another high source of nitrogen, and these can be added along with compost. A good 1-2 inches of compost is beneficial a couple times/year when getting started with no-till farming. So you just learned about sheet mulching, but that isn’t the only way. There other method, which I prefer, is called occultation. This is the method I used to get started. Mow down any cover crop, grasses and/or weeds. Apply compost and amendments and then cover with landscape fabric. Landscape fabric has become my favorite “tool” on the farm. It’s a woven plastic material that will let in water and air, but blocks sunlight. This is important because soil life needs air and moisture to thrive, but the weed seeds will sprout and the lack of sunlight will inhibit them from growing. While the sheet-mulching method is resource intensive, this method is time intensive. It takes 4-6 weeks for everything to be properly decomposed. However, when it’s finished, you have a beautiful clean and weed-free slate to start growing on. Also note that again, you will essentially be planting your transplants in your native soil. This may feel like you’re taking a huge gamble. For me, it did. You can read all about my humble beginnings starting with no-till growing in my post, My experimentation with Occultation. I am also here to tell you that this experiment worked! I farm with heavy clay soil and even though I planted my transplants in the clay the first year, I still had some flowers that were 6 feet tall and thriving! To continue no-till growing along your same beds after your plants are finished producing, there are a few ways you can approach this. The best way would be to take an intensive growing approach. This is what I learned at The Singing Frogs Farm workshop I took last spring. 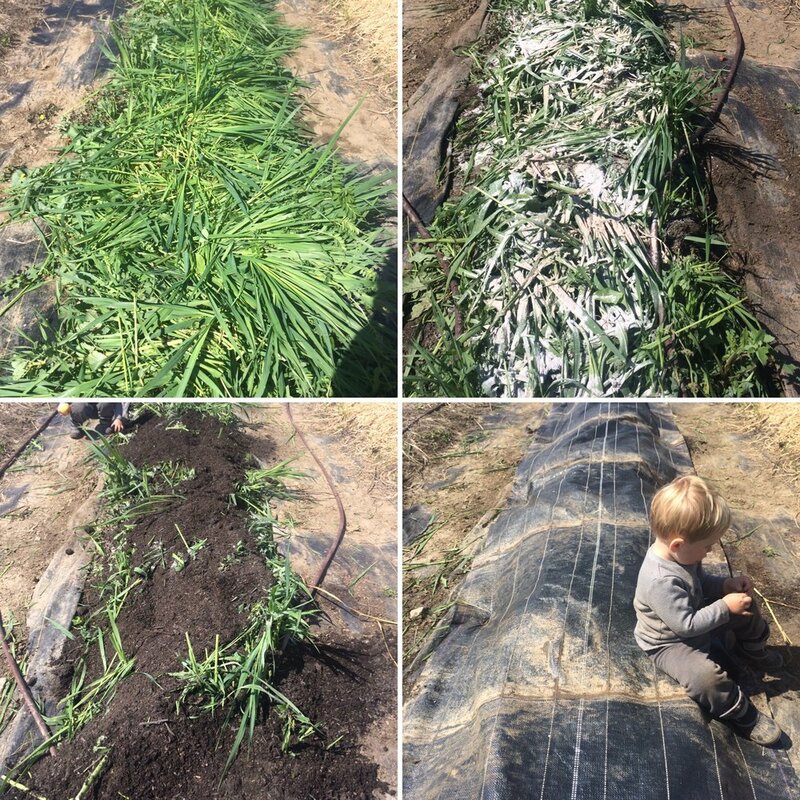 After they harvest a crop completely, they’ll take out the remainder of it by cutting the main stalk at soil level, leaving the roots in the soil, and haul that above material to the compost pile. Then, they’ll top dress the soil with compost, feather meal, and oyster shell amendments and then right away, they’ll plant new transplants in the space directly next to where the old crop was growing. The goodness behind this way is that the beneficial biology and rhizosphere from the old roots will transfer over to the new roots of the new transplants giving them the edge to succeed. Another method, if you are not ready to transplant into the same bed right after one crop is finished, is to do occultation again and wait at least 4 weeks. This is a fast way to build soil tilth. If your plant material is not diseased, cut it at the base again leaving the roots in the soil and keep the plant material on the bed. If it is diseased, I would not leave the material on the bed and it’s questionable whether you should compost it. Once your plant material is on the bed, I would suggest stomping on it and even cutting it more into smaller pieces. If you have a mower that will take down large plant material that would be perfect to use here. After, sprinkle your amendments and add compost and cover with landscape fabric. Watering these beds a few times while you wait will speed the breakdown process. After a month, if it looks ready, you can plant into your new bed, raking aside any stalks that were a little too thick to break down. You can read a more in depth How-to post with lots of photos in my other blog post, Preparing the Next Bed: No-Till Style! Lastly, if there will be a considerable amount of time before you plant in the same bed again, you can plant a cover crop. After you cut your plants at the base leaving the roots in the soil, you could sprinkle cover crop seeds, cover with compost and water. Alternatively, you could do the occultation method and then sow your cover crop seeds after the decomposition. Through sheet mulching and/or occultation, we allow the soil dwelling organisms to naturally incorporate additions on top of the soil when given a little time and moisture. Through using these methods, time and time again, the soil tilth will begin to build up beautifully, and your farm will thank you. I hope this information provided is enough to get you started on your no-till journey! I understand if there may be some skepticism and so, I’ll try to answer any questions that arise. Feel free to drop a comment below or ask questions and as always, happy growing!